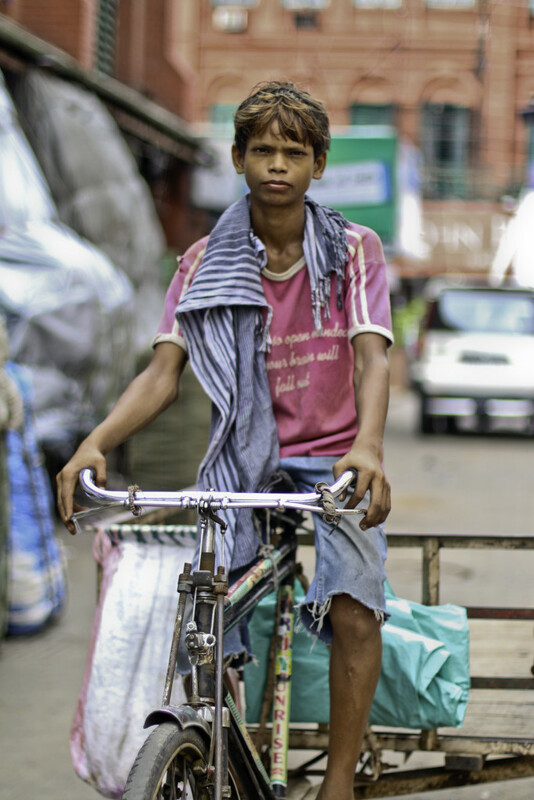 “All Work And No Play” was a collaborative project between Humans Of Kolkata and Help-Portrait Kolkata, India to make a humble attempt to document the ugly face of child labor in the city and the real innocent faces behind it. However, we did not TAKE their picture while doing this project. We GAVE it to them. A small act that changed the dynamics and helped them open up and share their stories of struggle, hope and triumph. This was also the first Help-Portrait that I attempted out in the streets, by-lanes and alleyways of the city. As real and raw as it gets! 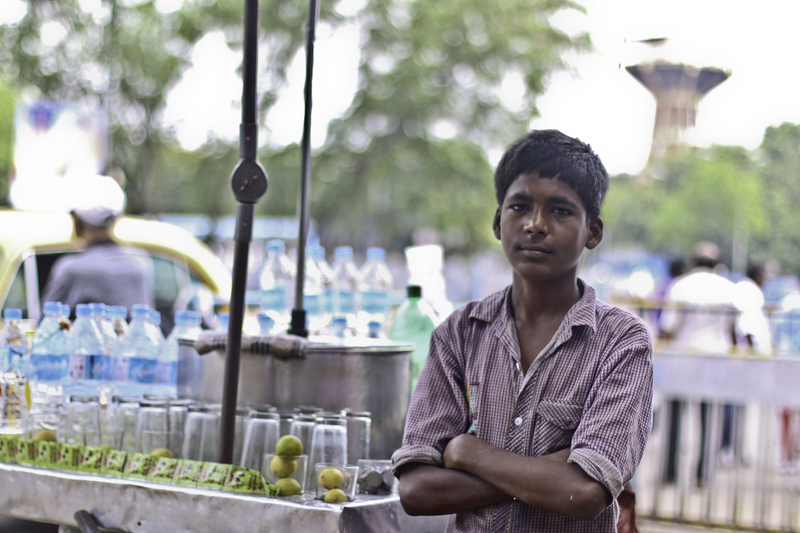 Our first subject was Raju (Paswan), 12, a refugee from Bihar who was running his “nimbu-paani” stall right outside the Esplanade metro station. It was quite a task to make him open up and get talking. The lad just wouldn’t speak. In hindsight, maybe it was pretty natural of him to behave like that in front of two camera lugging strangers out to sneak away a photograph and glorify his story in a newspaper daily. I’m sure that’s the picture he had of us in his mind, right then. Why wouldn’t he? After all, pictures of poverty ironically sells really well in our country (even more so, abroad) where the issue needs to be addressed more and sensationalised less. But everything changes, once you tell someone that you are there to give them the picture and not take it! After the obvious initial scepticism is over, subjects generally become surprisingly candid. Maybe it is due to our innate nature as humans, to connect with another fellow human, albeit for a a fleeting glimpse in time. Maybe it is due to our deepest desire to be recognised and acknowledged as someone worthwhile and special. Maybe, it is just the weather! Whatever it is, the magic happens almost every single time we’ve tried this trick! Raju’s story in a nutshell was that when life hands you lemons, you learn to make damn good lemonade! 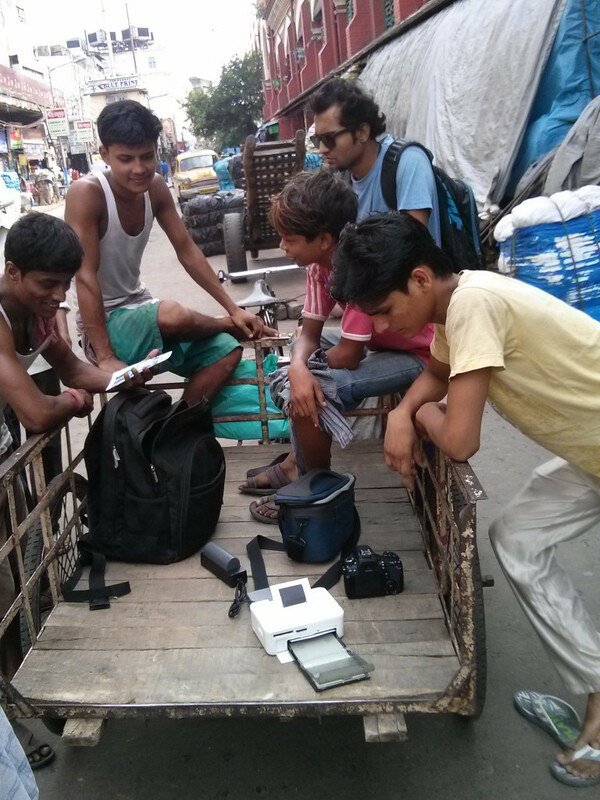 Our next story took us from an underaged street-side vendor to a couple of teenage manual labourers, bang in the middle of New Market. Both Salim (13) and Shahzad (19) work as daily wage labourers, transporting goods across the city on a pedal pulled tricycle cart. Ten hour workdays that often has Sunday’s rolled in and backbreaking hard work, out in the sweaty humid Kolkata summer. Not too much of fun, you bet. Surprisingly though, once they opened up, all this intense struggle was anything but what they talked about. As if it was a matter of fact. As if was perfectly normal. As if life was pretty good. Defiance, grit and resilience at it’s glorious best. Times like these put things into perspective and really make you appreciate what you have and stop whining for all the things that you don’t. By the way, Shahzad is a big fan of Salman Khan but Salim couldn’t care less about him. He all into the Tollywood hero, Jeet! Salim on his pedal pulled tricycle cart. 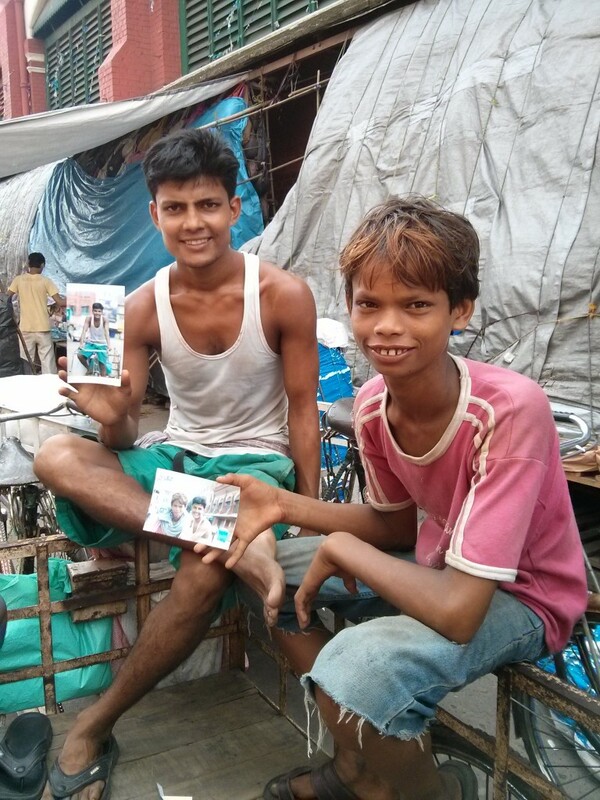 Salim and Shahzad, all smiles, with their portraits! 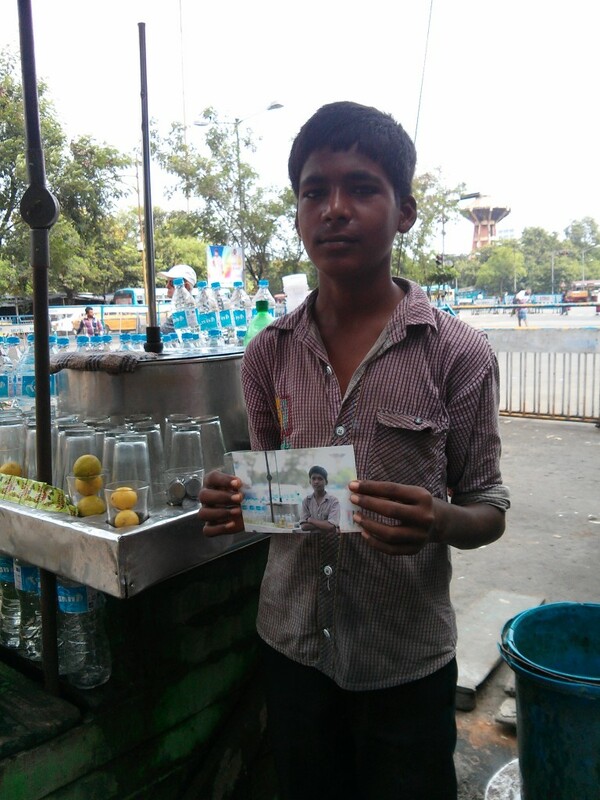 The last story that I’ll share with you is that of 11 year old, Bhola, who makes a living washing dishes and helping out at a street-side food stall near Collage Street. Initially hesitant just like all the others, he was the most challenging subject since his guardian was nearby and was overtly suspicious of our activities. As started earlier, maybe we were perceived as a couple of pesky journalists, out to feature a story and expose the child labour nexus in the heart of the city! It turned out, that Bhola did not have a single photograph of himself and thus the prospect of him getting one made him obviously excited. Once he shed his inhibitions and turned candid in front of the lens, we got some unadulterated moments from his day at work. It might be hard for him to verbally express his displeasure and anguish that he sometimes experiences at work but his facial expressions in the picture below tell that story rather ironically and eloquently. The image that we gave out to Bhola and the one that we would love to picture him in, forever – wide grinned, happy and carefree. 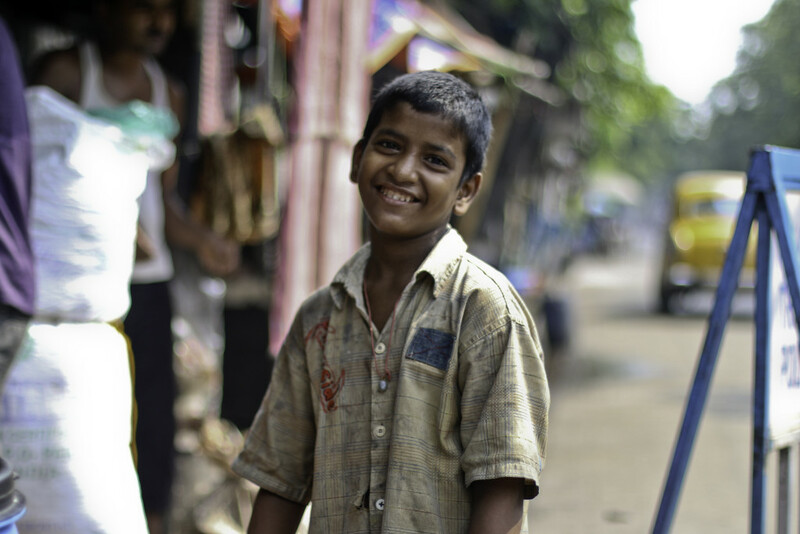 Over the course of this project, we met several other children on the streets of Kolkata engaged in various other professions and work, who daily sacrifice the best years of their life under the ugly premise of child-labour. We met Monu who sells furniture in the narrow alleys of Shealdah, Jayant and Ravi (pictured below) who “run” a tea stall in M.G. Road, Ismail who helps out his brother at his food stall in Chadni Chowk. The list goes on and on and on. All of them have one thing in common. They all suffer the indignity of toiling away their days when they should be hard at play not at work. Sadly, we couldn’t change any of that but after we were done with this modest little project we did make sure they had one more thing in common. A photograph of theirs to keep with them, forever and memories of their random encounter with a couple of strangers who lightened their sweaty summer day, one teeny tiny bit! There’s beauty in that as well. Cheers! 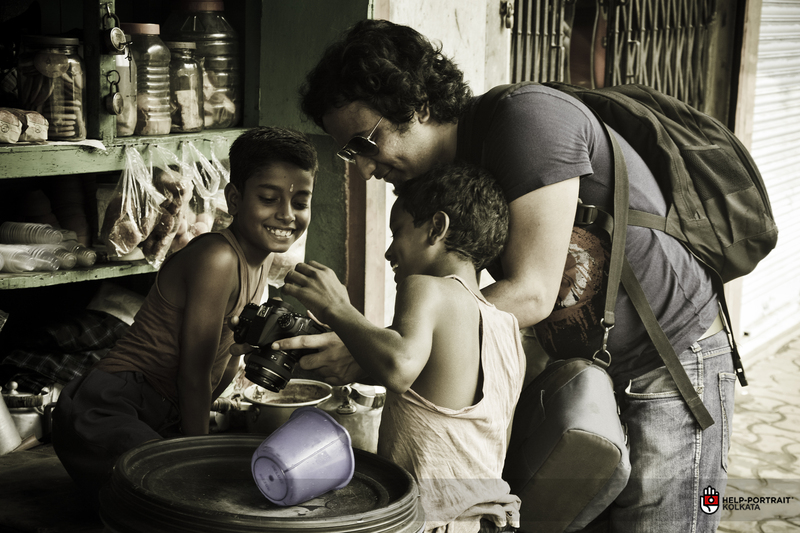 The project, “All Work And No Play” was a collaborative work between Humans Of Kolkata and Help-Portrait Kolkata, India. Humans Of Kolkata has been Inspired by the hugely popular Humans of New York and it captures Stories from Kolkata, The City of Joy ~ Despair, Deceit, Delight, Dreams, Distress, Heart break and above all, Hope. 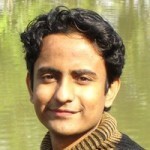 Special thanks to the founder of Humans Of Kolkata, Sourjya Singh for the help, support and participation.